Cebu City home-town favourite Rocky Fuentes keep the action sizzling here in the Philippines with an impressive high paced eight round shut out of Jemmy Gobel. 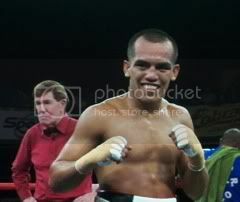 Fuentes was the aggressor throughout the bout and kept the heat on Gobel using a nice mixture of body and head punches. Gobel used a lot of ring savvy and moved well but Rocky was relentless in bringing the fight to his man. Fuentes jumped all over his man in the closing moments of Round 7 but Gobel hung on and got on his bicycle. In the eighth Rocky looked to put an exclamation mark on the bout and really stepped on the gas but Gobel showed durability to hang on. After eight rounds were complete all three judges had the bout scored scored in Fuentes’ favour by tallies of 80-70. Unheralded Filipino Romeo Jakosalem shocked favoured Canadian Steve ‘The Dragon’ Claggett in Round 8 moments ago in Cebu, Philippines, scoring an eight round technical knockout. The bout started out as a fire fight with Jakosalem bloodying Claggett’s nose in the opening round, but the Canadian charge came storming back and began to back Jakosalem up. In the third Claggett dropped Jakosalem twice with two hard shots to the liver, but the prideful pinoy showed grit to survive the round. Claggett continued to be the agressor down the stretch landing an array of powerful lefts and right hands but in the final round Jakosalem went for broke and hurt Claggett in the opening moments. Claggett was hurt but did well to hang on as Jakosalem pressed the action. The referee waived the bout off with Claggett on his feet protecting himself. The bout was stopped at 1:28 mark of Round 8. The Filipino showed a ton of heart to rally late improved to 12-4-1 (6 KOs) while the Canadian slips to 11-1-1 (6 KOs) suffering his first pro defeat. WBO Asia Pacific super bantamweight champion Kenichi Yamaguchi out-pointed Filipino Marjohn Yap moments ago at the Waterfront Hotel & Casino in Cebu. Yap did well early on landing some big shots but Yamaguchi asserted himself down the stretch. After eight rounds were complete all three judges had Yamaguchi ahead by scores of 76-75 and 77-74 (x2). Undefeated teenager Albert Pagara improved to 3-0 (3 KOs) moments ago in Cebu, Philippines with a first round blowout of Rey Seneres. Pagara threw his right hand like a torpedo and found the mark several times early. Seneres tried to retreat but Pagara stalked him relentlessly and dropped him twice on route to a first round TKO victory. Baby-faced Boyce Sultan won a scintillating barn burner against wild swinging Francisco Soli moments ago in Cebu when he battered the larger opponent into submission in the second round. Solis came out swinging and landed a few big punches on the youngster in the opening moments but he absorbed the punches well. Sultan came roaring back late in the round and hurt Solis with some big hooks. In Round 2 he unloaded an array of body shots that put his man down and out to improve to 2-0, 2 KOs. Flyweight prospect Roma Rate improved to 2-0 (2 KOs) in the opening bout of the evening at the Cebu Waterfront Hotel & Casino when he stopped Camilo Rey Seneres in the opening round. Rate was too acruate and a big right hand spelled the end of Seneres when the referee called a halt to the bout. Unbeaten Filipino flyweight Milan Melindo scored a stunning first round knockout of Mexico’s Rosendo Vega moments ago in Cebu City, Philippines, putting a resounding exclamation point on a big night for the Philippines vs. global opponents. Melindo started out boxing beautifully and was showing Vega all kinds of angles. The rugged Mexican did his best to come forward but he ate a lot of leather as he charged forward. In the closing moments of the opening round Melindo scored a telling uppercut that dropped Vega hard. He barely beat the count and was sent down a final time by an equally stunning uppercut. Renowned referee Bruce McTavish completed a full ten count as Vega laid hurt on the canvass. With the big win Melindo improved to 24-0 (8 KOs). 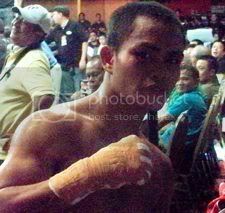 WBO Asia Pacific bantamweight champion AJ ‘Bazooka’ Banal was very impressive in the co-main event of tonight’s “Pinoy Pride 4″ card at the Waterfront Hotel & Casino where he stopped rugged Tanzanian Francis Miyeyusho in two rounds. Banal started out quickly and found a home for his big right hand early and often. In Round 2 ‘Bazooka’ landed a laser beam of a right cross that dropped Miyeyusho hard. He showed a lot of resolve getting up but was quickly sent down again by a right cross. While he made it to his feet again Miyeyusho went down again from a body shot where he was counted out. With the big win Banal improves to 24-1-1 ( 18 KOs). 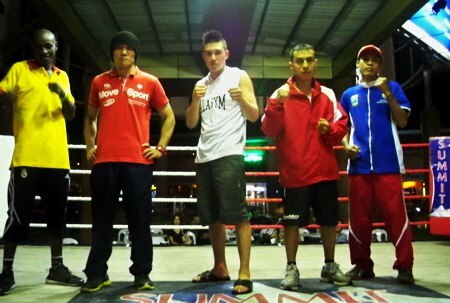 The World ready to take on the Philippines March 19 in Cebu! Five boxers from around the world takes out on Phillipines From left to right: Francis Miyeyusho (Tanzania), Kenichi Yamaguchi (Japan), Steve ‘The Dragon’ Claggett (Canada), Rosendo Vega (Mexico) and Jemmy Gobel (Indonesia). Pinoy Pride 4 : March 19, 2011 Cebu City Waterfront Hotel & Casino in Cebu, Philippines. 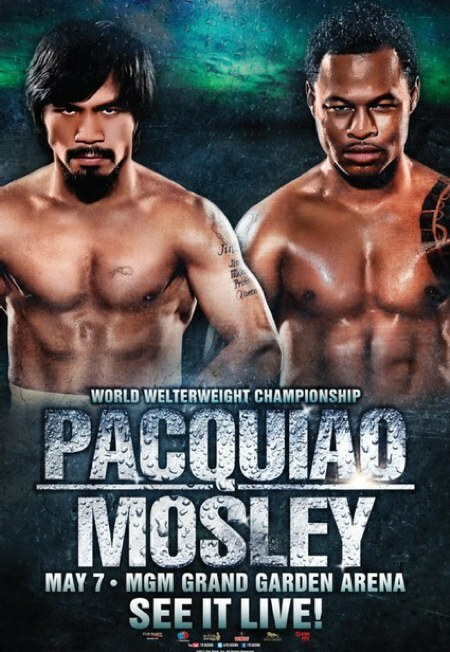 Manny Pacquiao vs. Shane Mosley Fight Poster revealed! 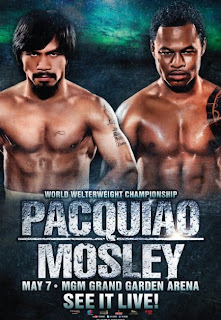 Top Rank Promotions has unveiled the official fight poster for the May 7 mega clash between Manny Pacquiao and Shane Mosley. Wolak beats Forman Wolak improve to 29-1 (19 KOs) while Foreman dropped to 28-2 (8 KOs). 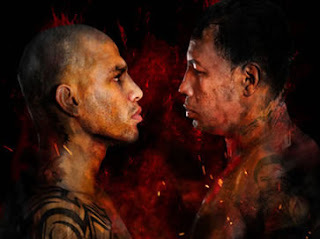 , Cotto with the victory against Mayorga Miguel Cotto improved to 36-2 (29 KOs) and retained his WBA junior middleweight title. 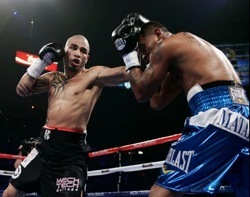 Im a fan of Cotto, and he will beat Mayorga by TKO . Zab Judah TKO Kaizer Mabuza. Zab Judah Capture his 5th World title ! Canelo Alvarez beats Hatton to earn WBC 154-pound title! That was once Pacquiaos belt . and hes just 21 years old! Fights to watch tonight, Im going for Hatton, and Zab.